Change background color to F5F5F5. Note: This is not the complete landing page. For latest, please look at screenshot at https://tracker.ceph.com/issues/24573#note-36. The OSD box layout seems not scalable at my taste. I don't know if that is visually possible but having up/in/down/out in fixed positions with numbers below will be a great improvement to get a constant place for those important numbers. I think that's just an enhanced version of the same problem seen in Metadata & Monitors boxes as we have more sub-states and bigger numbers. 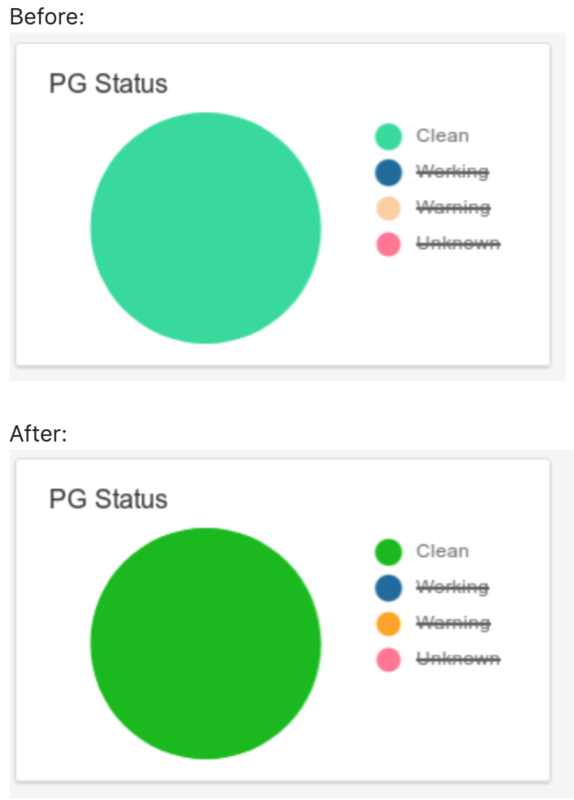 Updating the pie chart color palette to allow up to 5 different colors (as needed by the PG Status panel). I suggest to select other colors as their are too close from each others (dark blue / light blue, purple). For people having color blindness that will be a nightware. On http://paletton.com you can simulate color blindness to find out if the choosen colors are ok. Noting that this needs to be reconciled and merged with https://tracker.ceph.com/issues/27050. Yup, that's been a topic we've discussed previously. The good thing is that all charts have tooltips, so in case of doubt just moving over is enough to make it clear. On one side, for data visualization, especially when it comes to status monitoring, green-red pairs are extremely intuitive (for 90% of the people), so we could look for another alternative, like adding background textures: ChartJS supports patternomaly. Noting here regarding https://tracker.ceph.com/issues/35691#note-7 (content/text scaling issues) for the OSDs, Monitors, and Metadata Servers cards that Erwan Velu commented about. - (2) replace the state with icons but then we would want that to be consistent elsewhere (e.g. pools list) and other cards as well as other views/pages to be consistent. See https://www.patternfly.org/pattern-library/cards/aggregate-status-card/#design for an example. - (3) alternately, we just report what's "broken," e.g. nnnnn (nnnn down, nnnn out) but this would need to be consistent elsewhere with the philosophy only report broken stuff vs. showing everything (ok and not ok states). See https://redhat.invisionapp.com/share/589XIRJBW#/screens for an example. My current recommendation is to try (1) above to see if this might work. @Alfonso - could you please look into this? I wonder if most of this hasn't already been addressed by your latest changes to the landing page in the meanwhile? According to an IRC conversations with Alfonso about this, the only thing yet to be addressed here is adapting the color palette and whether or not to add textures to colors for visually impaired users. Per our conversation during today's standup, we agreed to adapt the color scheme first and create a separate tracker issue that covers dashboard enhancements related to users with vision impairments (e.g. creating a high-contrast theme or using patterns for users affected by color blindness). These enhancements should not be specific to the landing page, but should apply to the entire dashboard. 1. Rather than changing the colors of the chart, adding a 1px border between chart segments allows us to clearly define the size of each segment for users who might not usually be able to see that change in color. 2. Utilizing a tooltip on hover or click for each of the segments allows colorblind users to make a clear connection between which value belongs to which label. I believe this is already implemented as stated by Ernesto above. The idea with the above is to ensure we can still convey the same information that a color sighted user can gain from color. I have attached a mockup showing how that might look (I think whatever tooltip style you currently have should be fine, mainly want to show the 1px border). The alternate as already stated is to add background textures, which is a good solution as well, though I've found it can be difficult to reflect the patterns in the key without the key shapes having to be unnecessarily large. However this might not be as big an issue and if it is the preferred solution I would be happy to create some mockups reflecting that. - Added border for chart slices (visual impairment help). - Adjusted chart vertical centering (Ernesto Puerta suggestion). Note that this modification resulted in a regression (loss of information) about Ceph Pools. I have submitted #36740 to keep track of this. 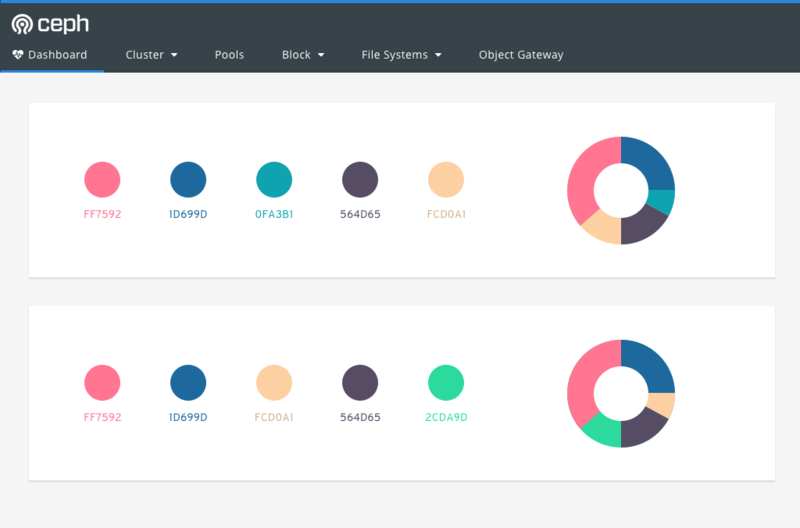 Noting that we're planning to change the green and beige on the color palette to match the status colors for better UX. See https://github.com/ceph/ceph/pull/26203#issuecomment-459385271 for further clarification.